German scholar; born at Dessau in 1751; died there in 1784. On account of his liberal views he was highly esteemed by Moses Mendelssohn, but when he endeavored to harmonize the usual Jewish system of training with modern European culture, he was persecuted by the conservative element among the Jewish scholars, and even his friends nicknamed him "the backslider." 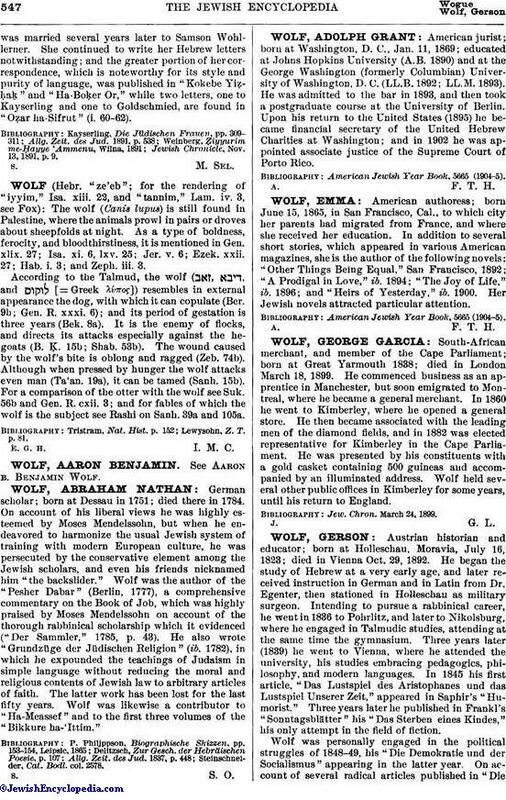 Wolf was the author of the "Pesher Dabar" (Berlin, 1777), a comprehensive commentary on the Book of Job, which was highly praised by Moses Mendelssohn on account of the thorough rabbinical scholarship which it evidenced ("Der Sammler," 1785, p. 43). He also wrote "Grundzüge der Jüdischen Religion" (ib. 1782), in which he expounded the teachings of Judaism in simple language without reducing the moral and religious contents of Jewish law to arbitrary articles of faith. The latter work has been lost for the last fifty years. Wolf was likewise a contributor to "Ha-Meassef" and to the first three volumes of the "Bikkure ha-'Ittim." Steinschneider, Cat. Bodl. col. 2578.